FAQ: Are there portable spill berms for 55 gallon drums of waste oil? Question: I need a portable spill berm for storing 55 gallon drums. I need the diameter to be large enough to hold a 55 gallon drum and contain the contents of the drum, if necessary. The drum stores waste oil. The spill berm needs to be collapsible. 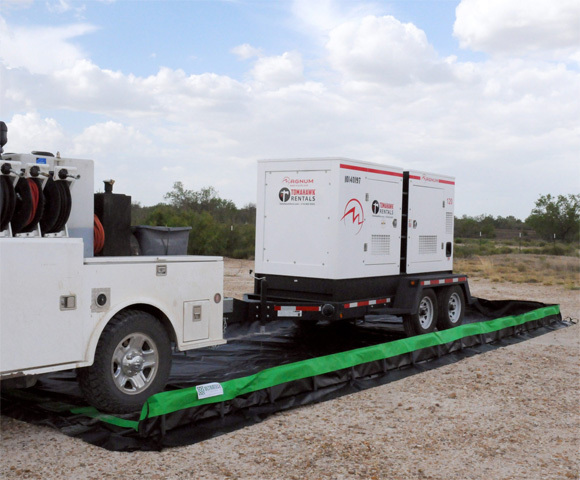 Answer: For this kind of portable spill containment, a great option would be one of our Spill Containment Berms. These berms are collapsible, portable, and equipped to successfully store waste oil and liquids from your containment tank. Berm are made in two different models: Aluminum Angle and Foam Wall. Questions? We can help! Call us at: +1-772-646-0597 or request a quote to discuss your project. Since you are looking for a secondary containment option that can successfully store the contents for your 55 gallon drum, the first option you may want to consider is the Aluminum Angle Berm. This berm is built with aluminum angles that creates a wall height of approximately one foot (1') for increased storage capacity in the event of a spill. We also offer a Foam Wall Berm that can be used for containment and drive-through storage requirements. In order to contain 110% of the capacity in your 55 gallon drum, we would recommend a 3' x 3' x 4" square that can hold 60.5 gallons. Dollies can be used to roll the drum directly over the side of the wall and onto the portable spill berm as needed. For more information on secondary containment options, please check out our Secondary Containment Products Page.